54th Street Grill and Bar operates grill and bar style restaurants. 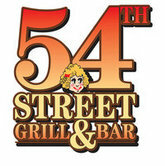 The 54th Street Grill and Bar has an American cuisine offering munchies, salads, mile high biggie burgers, combos, soups, super sandwiches, five four favorites, deep south favorites, pasta, seafood, gringos Mexican kitchen, streets steakhouse, street kids desserts, sides, and beverages. The 54th Street Grill and Bar has locations at Kansas City, Missouri, and St. Louis metropolitan area, and San Antonio metropolitan area in Texas. The meats and other ingredients in 54th Street Grill and Bar restaurant are prepared from scratch for better taste of foods. There are currently 1 consumer reviews about 54th Street Grill & Bar available. Share your review. Please take a note that you are about to post a public review about 54th Street Grill & Bar corporate office on CorporateOffice.com. This review will be public, so please do not post any of your personal information on this website. If you would like to contact the corporate offices of 54th Street Grill & Bar, please use their contact information such as their phone number, website, and address listed above to contact them. However, sometimes staff from 54th Street Grill & Bar headquarters do read the reviews on this website.